Arunachal Pradesh Chief Minister Pema Khandu has congratulated Muri Linggi for becoming the third woman from the State to conquer Mount Everest – the highest mountain peak in the world on May 14 last. “If you are determined to fulfil your passion and dream to achieve great – the circumstances or the age doesn’t matter. 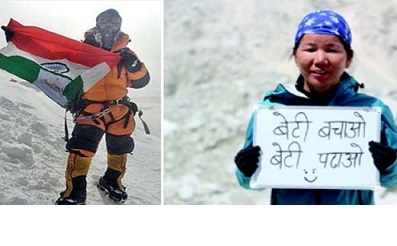 40-year-old mother of four girls, Muri Linggi has proven that by becoming the third woman from Arunachal Pradesh to conquer Mount Everest – the highest mountain peak in the world on 14th May 2018,” Khandu said in his congratulatory message. Meanwhile, Arunachal Pradesh Governor BD Mishra has also extended his heartiest felicitation to Muri Linggi for scaling Mount Everest. Congratulating Linggi, the Governor said that people of Arunachal Pradesh are proud of her. “You have proved that our Arunachali daughters are tough, courageous, adventurous, meritorious and better than any other. Your achievement has made us proud and you have set an example for your Arunachali sisters to emulate,” the Governor said while wishing Linggi all success in her future endeavours.